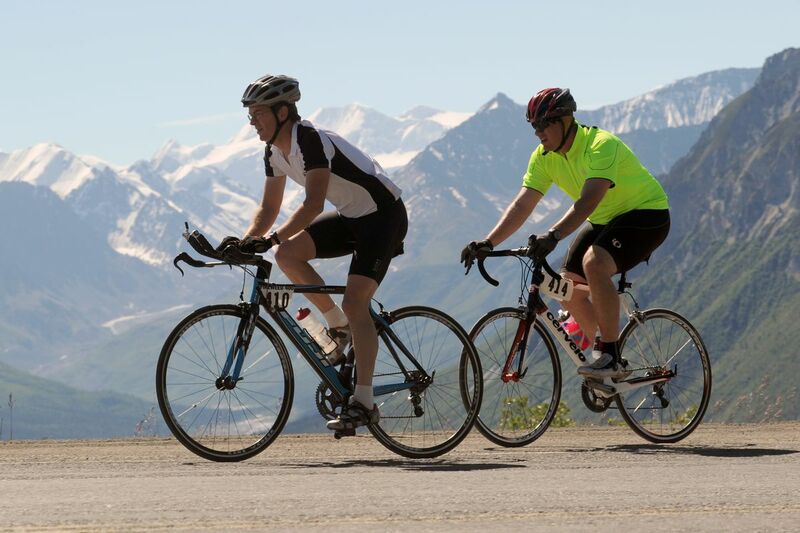 As the 15th edition Alaska's biggest bike race gets rolling this weekend on a visually stunning course that wends its way along the Glenn and Richardson highways from Sheep Mountain to Valdez, one can't help but wonder if road racing is waning a bit in Alaska. After all, the number of racers signing up for the Fireweed 400 declined from nearly 700 in 2015 to fewer than 500 last year. At the same time, bike shop owners say mountain bikes' popularity continues to grow, and fat-tire bikes are hotter than ever. Registration for this year's Fireweed was still underway Thursday. "It seems like there are different waves of interest," said Christina Grande, a Fireweed 400 board member. "In the summertime, there's so much going on — and there's just 12 weeks of summer. How do you cram it all in?" Grande estimated only about 10 percent of the Fireweed competitors are hard-core racers, while most simply enjoy being part of a relay team in a memorable setting that features a nice barbecue when the pedaling is done. "It's a pretty long race in a different setting — a nice reason to get away," Grande said. "A lot of people do it together as a team, and those people are pretty stoked." Even if the Fireweed ends up with fewer competitors, it'll still have a dizzying array of races within the race — single riders in races from 50 to 400 miles, time trials, two- and four-rider teams, tandem bikes and mixed teams of men and women. Two of the races start Friday — the brutal 400 mile event from Sheep Mountain to Valdez and back, and the Great Alaska Two-Day 300K, a loosey-goosey untimed event that's more a tour than a race, with racers starting at different times. "The largest single race is the 200," said Jim Mendenhall, president of the Fireweed 400 race committee. "That last part coming down Thompson Pass (into Valdez) is pretty fun." The namesake 400 is a qualifier for the Race Across America, and more than one Fireweed finisher has made the jump to the big race. But it's a daunting effort that only attracted two racers last year. "It's just a long time on a bike," Grande said, who plans to race the 400. "Who wants to do that? I've done multiple centuries (100-mile races). Maybe I'm trying it because I'm a fool. I have to think of it as one mile at a time. "I've seen people in their worst and best moods as a cyclist. Hopefully, I learned from that experience and try not to get super fatigued." In addition to cruisers in races like the 300K, there are deadly serious racers like Sheryl Loan, who two years ago took down the 100-mile race record with a time of 4 hours, 38 minutes, 2 second, while beating every other man and woman in the race. Earlier this week, Loan, 58, warmed up for the Fireweed 400 by finishing 20th overall at Mount Marathon in 1:03:08 — the best finish by any athlete over 38. Just enough to stretch the quads a bit for a few hours of furious weekend pedaling. *Great Alaska Half Century: A 50-miler out and back from Sheep Mountain Lodge. *Great Alaska Double Century: The biggest event, with more than 100 solo riders and even more on relays. The last 60 miles, riders see glaciers, waterfalls, rivers, and Thompson Pass before finishing in Valdez. *Fireweed 400: From Sheep Mountain to Valdez and back. Because of Friday start, racers may see outgoing racers in events that begin Saturday. *Great Alaska 2-Day 300K: An untimed event with no divisions. Starts Friday with the first 120 miles before stopping overnight at Tosina Lodge. Ends Saturday.